Rah! Rah! Rah! 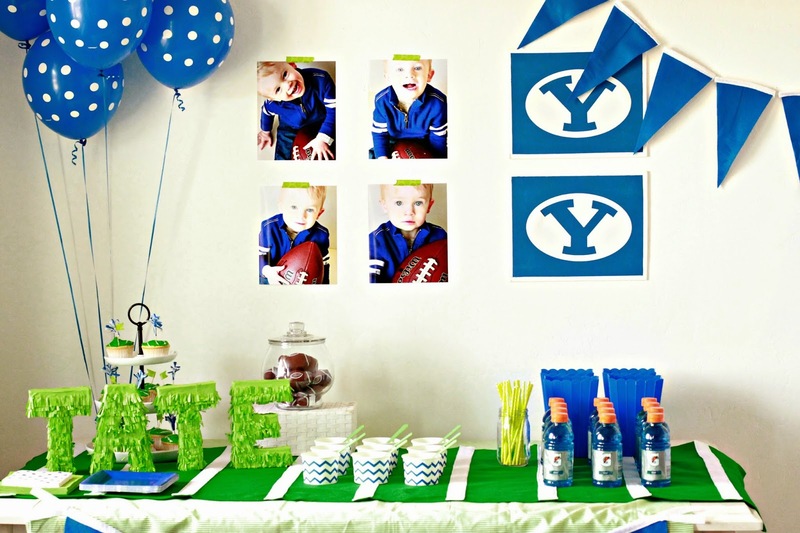 Time for a Go Cougars Birthday Party! Our Little Bean loves football. Loves it! 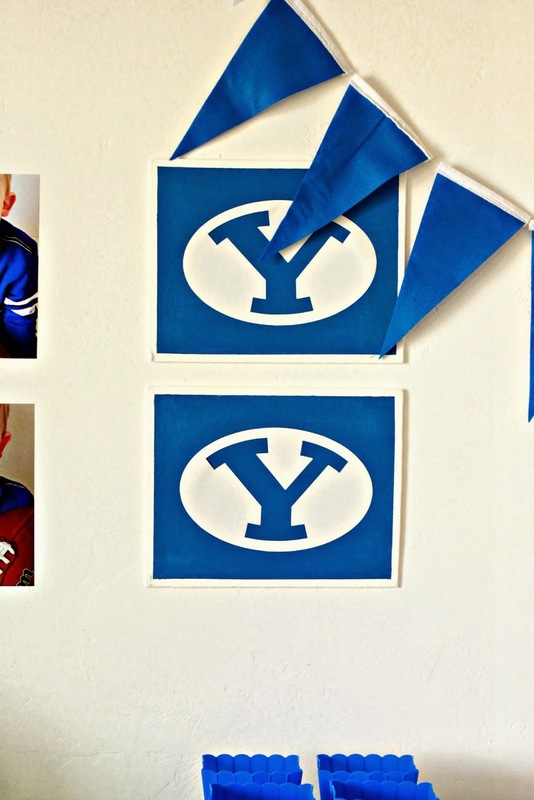 He is especially true blue for our BYU Cougars. Whenever he sees The Hubs in a BYU shirt he says, "Football. Go Cougars!" Yeah we train them up young around here. 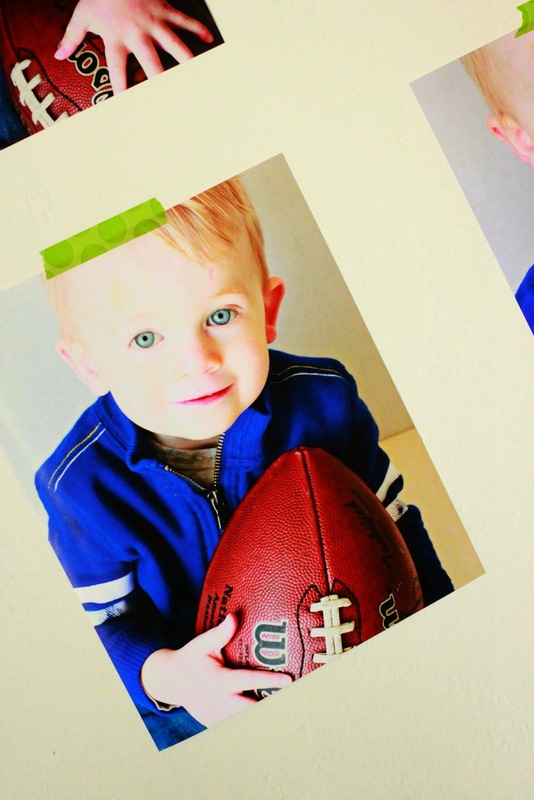 This year I figured it would be fitting to celebrate his 2nd birthday football style. 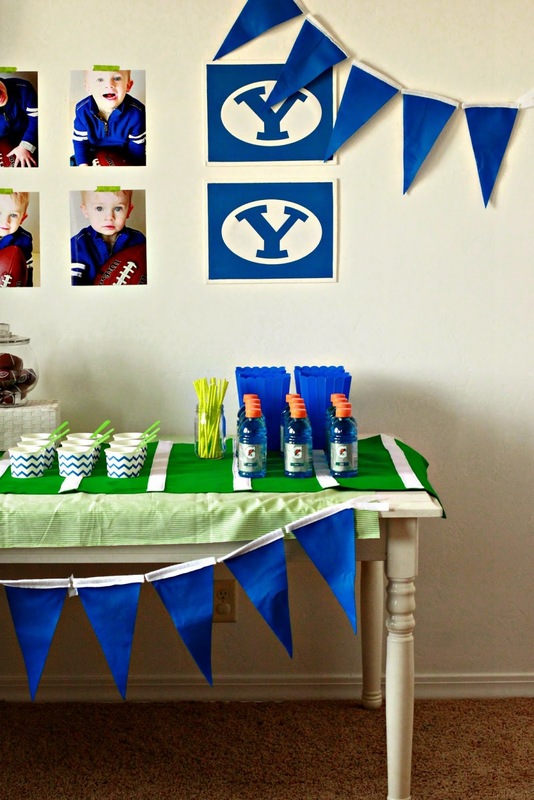 A little Go Cougars Football Birthday Party to be exact. 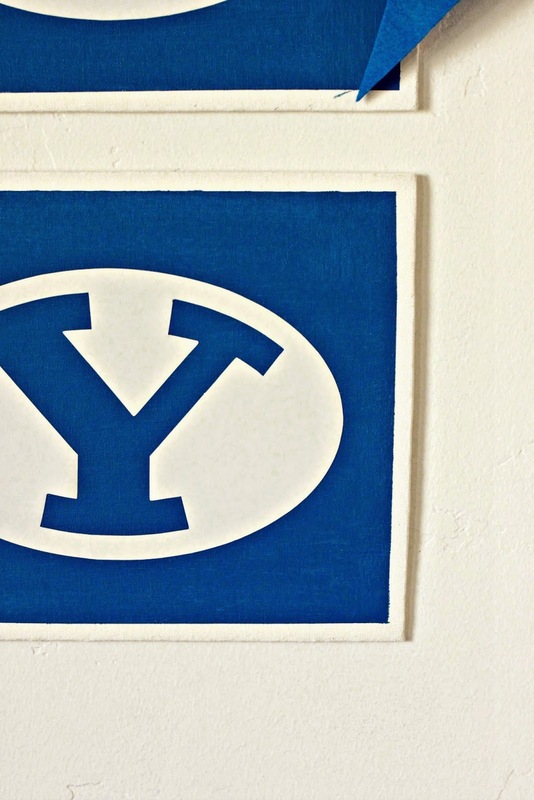 I went with classic BYU colors for the color theme. Good old royal blue and white. 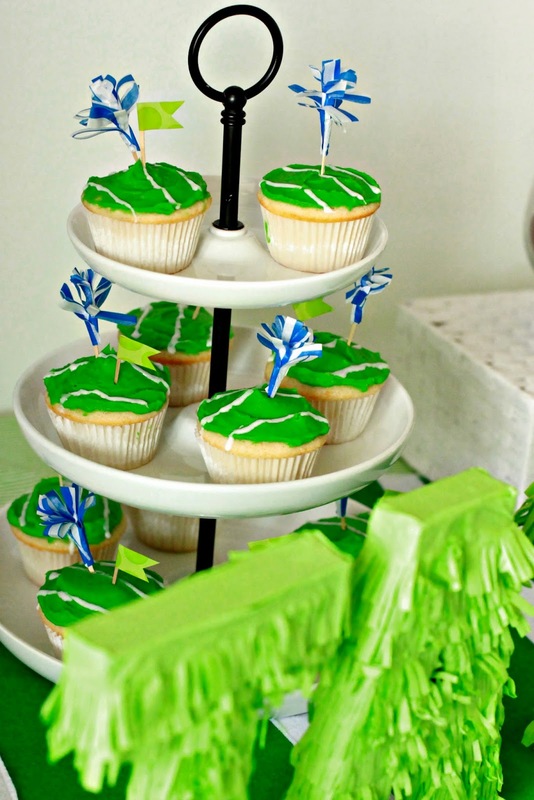 I also added in some vibrant green to represent the football field. I made this Y art using flat canvases and vinyl. Easy Peasy. I also made some classic pennant flag banners using felt. 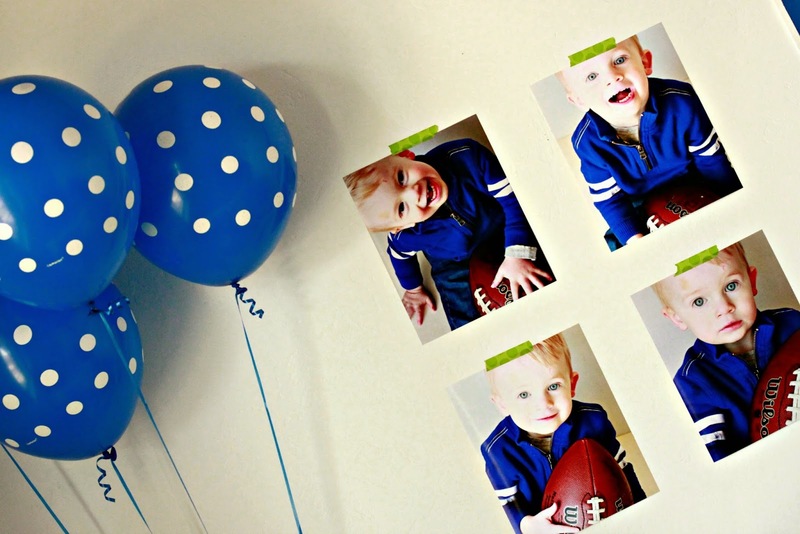 An easy way to make a simple, cheap, but totally adorable birthday party backdrop is to print off photos of the birthday kiddo. I took these photos of Bean dressed in the birthday colors and holding a football. I printed off 4 8x10's and taped them to the wall with green washi tape. 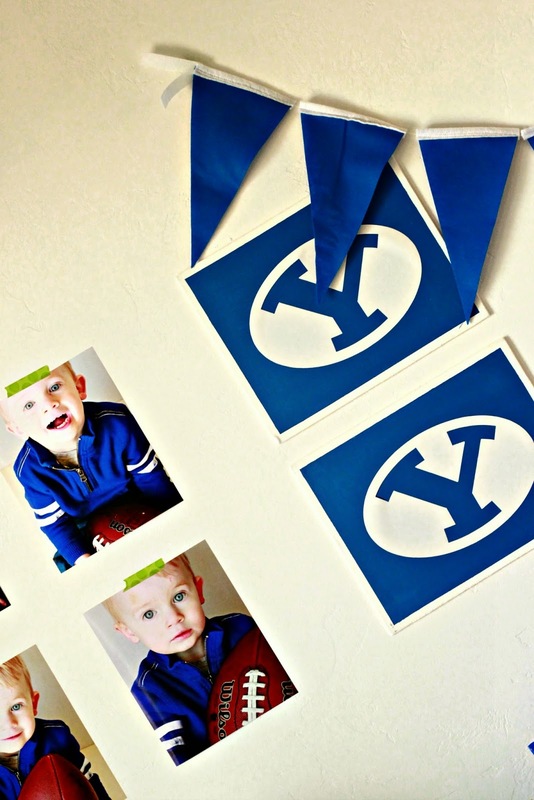 I hung them up right by the Y canvases. He sweet face was kind of the party show stopper. On the table I added some cute little hacky sack footballs. 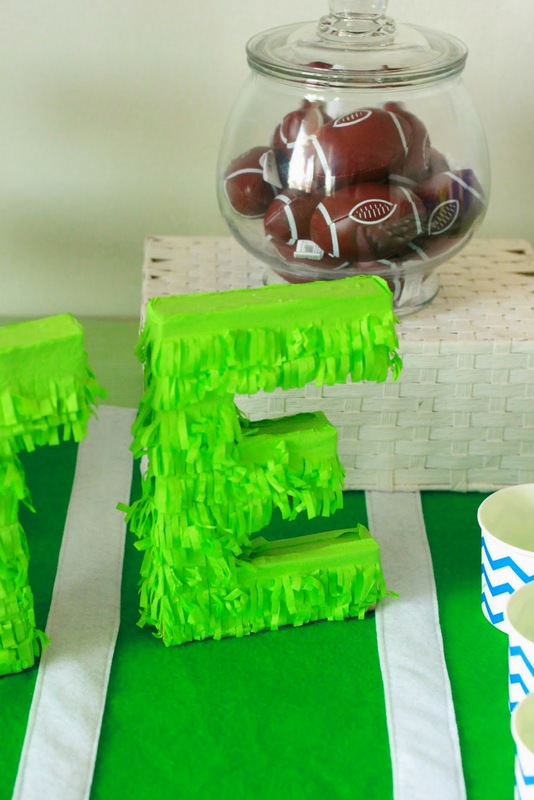 I also used a similar process to the Pinata Letters I made last year to make these "grass" letters. I just cut the slits much smaller. I also made a football field table runner out of felt. There was blue, white, and green everywhere. 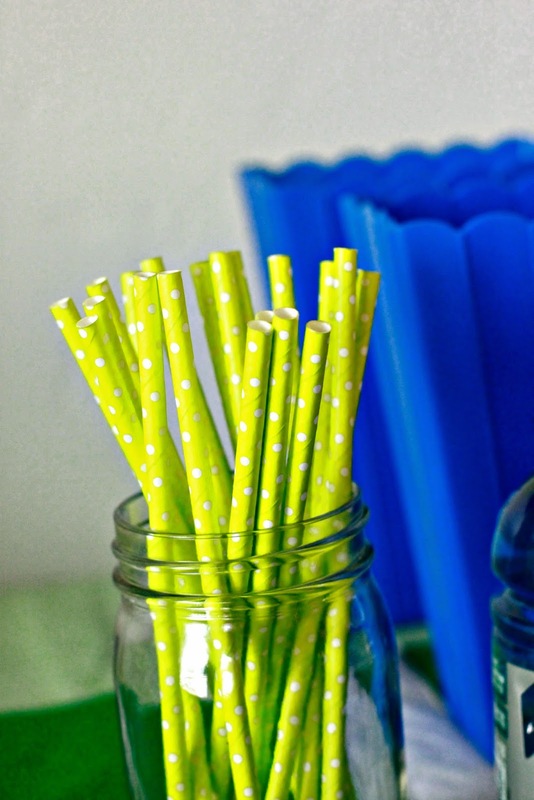 I got these straws in Target's Dollar Spot. So cute right? 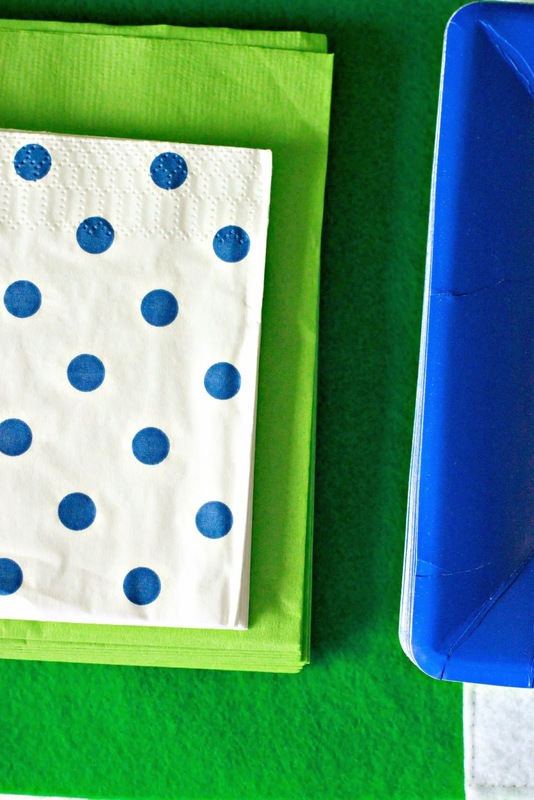 Mixing colors and patterns is really easy to do with napkins and plates. 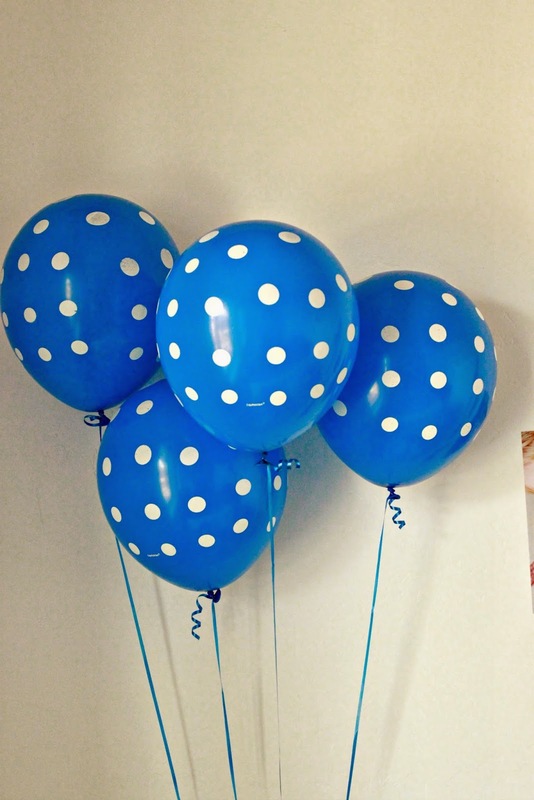 Love these polka dot napkins! 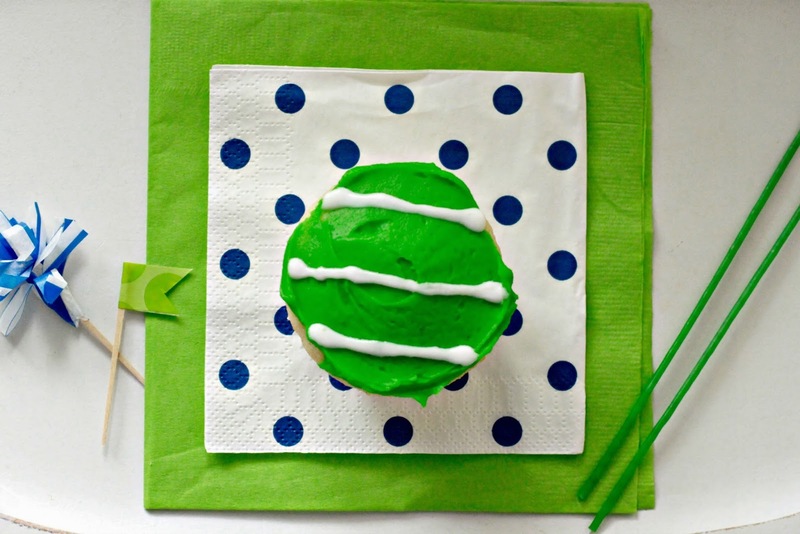 To bring in another touch of football, I very simply decorated these cupcakes like a football field. I went for a minimalist look for the cupcakes. 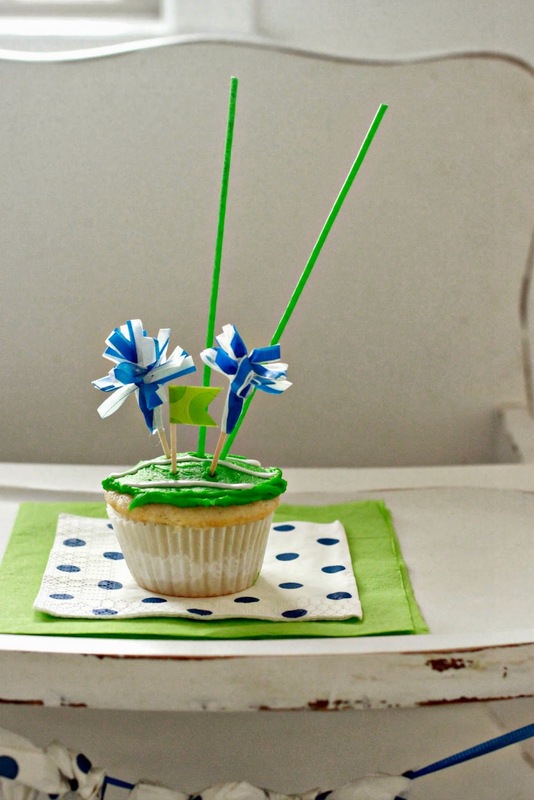 I embellished the cupcakes with little homemade toothpick flags and pom poms. For Bean's cupcake I added a few sparkler candles. 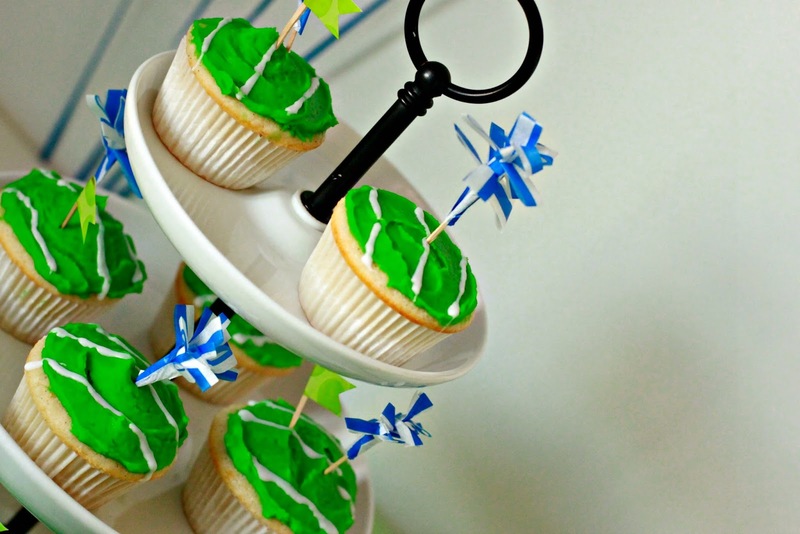 The little toothpick embellishments were made with the same green washi tape I taped the photos ups with. 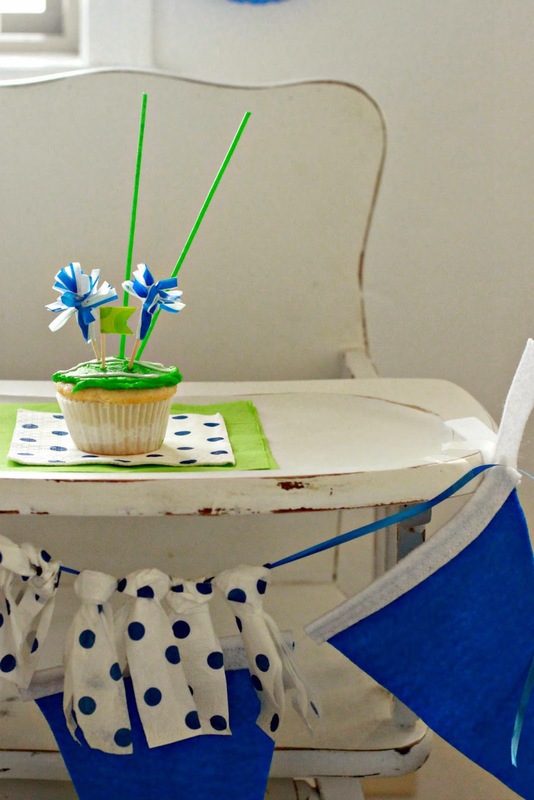 The pom poms were made with striped tissue paper. They were one of my favorite things. We served stadium themed food. 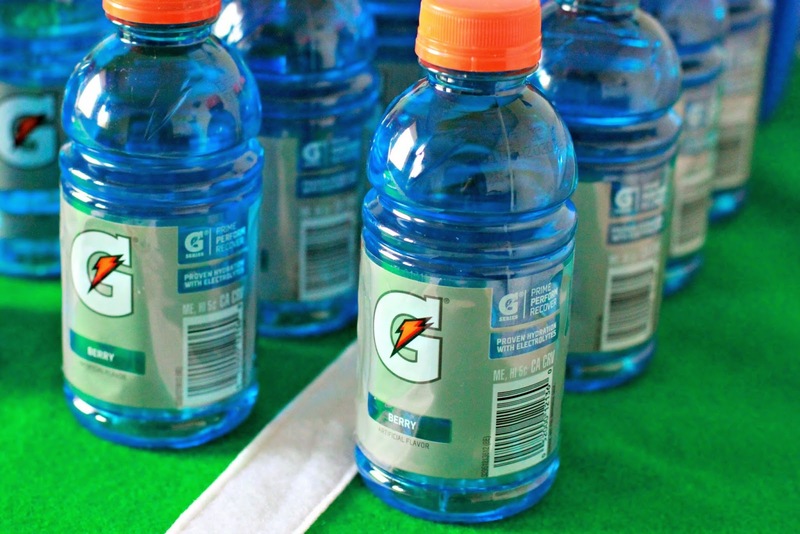 I really geeked out when I found Gatorade in the exact blue to match the party. It the little things people. 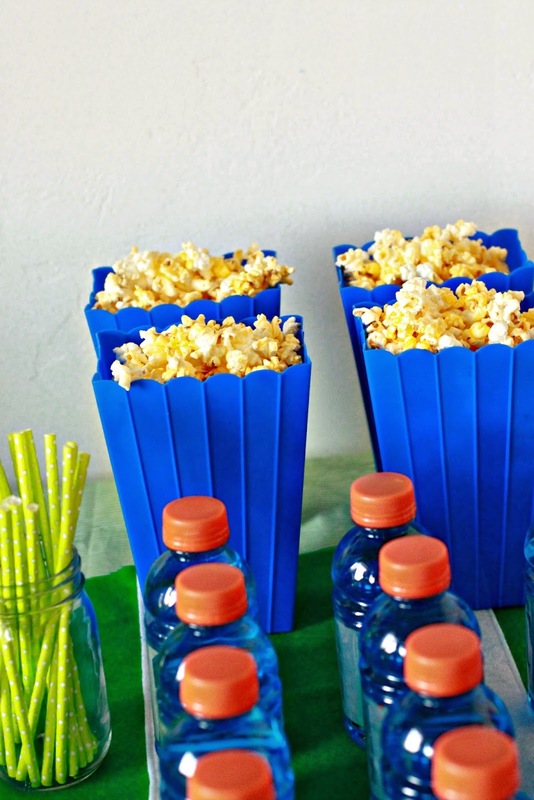 We had popcorn. There was nachos. We had hot dogs and chips. There were lots of good eats. We had a blast. It was football madness. He loved every minute of it. It was a fun party to throw and was worth all the work the minute I heard him excitedly repeating "football" over and over.